“We observed that the whole process of egg development and its interaction with its environment is not static. It's very dynamic,” adds first study author Stephany El-Hayek, who was a PhD student in Dr. Clarke’s lab at Glen site of the RI-MUHC at the time. 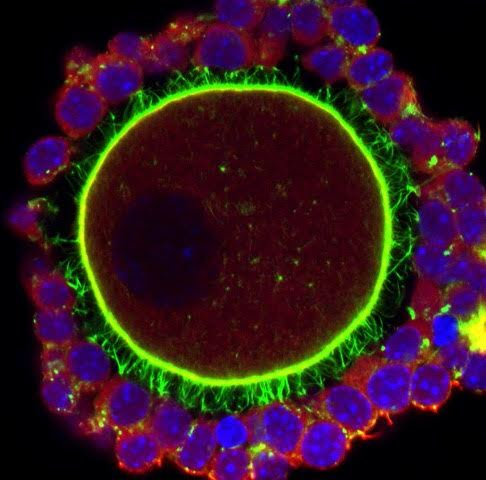 ILLUSTRATION: The image shows a growing oocyte in the middle, which is very large with a bright green rim, surrounded by many small red follicle cells whose nuclei are stained blue. The thin bright-green hair-like structures between them are the feeding tubes, which grow out from the follicle cells when they receive signals from the oocyte. This image was captured by using confocal microscopy at the Imaging Platform of the Research Institute of the McGill University Health Centre, Montreal, Canada.